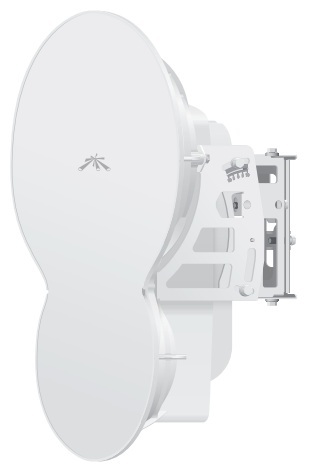 Can Ubiquiti translate their success in the wireless market to high-capacity carrier class backhaul? This is what they are aiming for with AirFiber, their latest product, promising "a new era in price disruptive, carrier-class backhaul." In this note, we look at this new release, its applications in surveillance, and how it compares to other options, such as Exalt, Trango, and DragonWave. 1.4 Gbps specified throughput, at ranges up to 13 km. 24 GHz frequency range, unlicensed worldwide. Built-in AirOS F configuration software accessible by web browser, providing speed and alignment testing, device discovery, and other functions. Specially designed mounting hardware and RSSI signal indicator to allow for one-man installation and alignment. AirFiber is shipping Q2 2012, and is available for pre-order now. A link, consisting of two radios, sells for $2,995 USD online. The main application for AirFiber in surveillance is backhauling large numbers of cameras, dozens or greater. Most commonly this is needed in municipal, military, or large corporate campuses, and even then are a small portion of installations. Though higher bandwidth, due to their higher frequency range, 24 GHz radios do not penetrate obstructions. Trees, buildings, and atmospheric effects are much more likely to disrupt signal. High frequency radios are typically mounted high on towers to avoid these issues, which may not be possible in all surveillance systems, or result in additional cost versus using lower-frequency radios. For lower-bandwidth applications, users will likely not gain much by selecting AirFiber over existing products, such as the Rocket or NanoStation, which are typically priced much lower, under $200. Though slower, they also utilize lower frequency ranges, less prone to disruption by weather and atmospheric effects, which is preferable in surveillance systems, to prevent video loss. AirFiber is intended to compete with other carrier class broadband radios, from providers such as Exalt, DragonWave, Trango, Motorola, and others, names which are not often seen in the surveillance market. Instead, these are typically used in high-bandwidth applications by cellular carriers, emergency management agencies, and others. For gigabit wireless specified products, AirFiber is significantly less expensive than anything currently available. Competitors with lower-cost options, such as Exalt, offer unlicensed 24 GHz radios for around $3,000 per side, making them approximately twice the price of AirFiber, though providing only 27 Mbps of throughput. Others, such as DragonWave and BridgeWave, which may offer gigabit speeds, have list pricing in the tens of thousands of dollars, far more expensive than Ubiquiti. History and stability are the main advantages other providers may claim over AirFiber, at least for the time being. Due to the critical nature of many high-capacity installations, reliability and stability are key selling points, which Ubiquiti cannot claim, being a brand new platform. However, given its pricing and specifications, along with the strong following gained by Ubiquiti's other products, we expect that AirFiber will have a significant impact on the market.